Lori is a therapist in L.A., living with her young son and seeing a man she calls "Boyfriend," when things start to fall apart. Boyfriend breaks up with her after 2 years together, for seemingly ridiculous reasons, sending Lori into a crisis. She starts seeing a therapist herself, a long time professional named Wendell whose methods Lori finds puzzling at first. The book is divided between sessions with Wendell, and sessions with her own clients, who include a self-absorbed TV producer, a young woman recently diagnosed with a terminal illness, and a woman in her late sixties who has determined to end her life if things haven't improved by the end of a year. Gottlieb weaves these stories together with skill and humor, bringing us with her every step of the journey, and in the process reveals our own selves to us. LORI GOTTLIEB is a psychotherapist and New York Times bestselling author who writes the weekly “Dear Therapist” advice column for the Atlantic. A contributing editor for the Atlantic, she also writes for the New York Times Magazine, and is a sought-after expert on relationships, parenting, and hot-button mental health topics in media such as The Today Show, Good Morning America, CBS This Morning, Dr. Phil, CNN, and NPR. She lives in Los Angeles. Learn more at LoriGottlieb.com or by following her @LoriGottlieb1 on Twitter. "Therapists play a special and invaluable role in the lives of the 30 million Americans who attend sessions, but have you ever wondered where they go when they need to talk to someone? 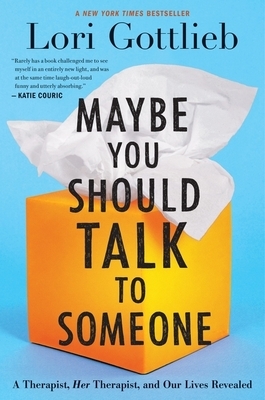 Veteran psychotherapist and New York Times best-selling author Lori Gottlieb shares a candid and remarkably relatable account of what it means to be a therapist who also goes to therapy, and what this can teach us about the universality of our questions and anxieties." —Thrive Global, "10 Books We Can’t Wait to Read in 2019"
—Irvin Yalom MD, author of Love’s Executioner, and other Tales of Psychotherapy, and professor emeritus of psychiatry at Stanford University.